HEREFORDSHIRE Council’s three largest opposition groups have joined forces in a bid to oust the Conservatives from power at Shirehall. The Herefordshire Independents, It’s Our County, and The Green Party have agreed to support each other in the run up to the May 2 county council elections. Group leaders hope to form the Herefordshire Alliance if they receive enough support from the electorate for a change on the council. Its leaders are asking voters to get behind the alliance candidate standing in their area – whichever of the three groups that candidate is representing. It’s Our County co-leader Liz Harvey said the alliance was hugely important in bringing about change at the council. “Vote for us if you believe in a broad more representative council,” she said. Green group leader Trish Marsh said her party has always been keen to cooperate with other parties they share common ground with. “We have a strong record on this nationally and locally,” she said. “None of the opposition parties have the resources to effectively contest and win elections in all wards in the county. “We all have to make decisions about where to focus our energies, based on existing strengths. Meanwhile, the Conservatives said it was their intention to field candidates for all of the council wards. Deputy leader Nigel Shaw said: “The Conservative group is aware that the opposition parties have had difficulty in finding candidates willing to stand in many ward areas, so their decision to work together in an electoral pact is not surprising. “It is currently our group’s intention to stand a Conservative candidate in all 53 wards of the county in order to satisfy the demand of the electorate. “The Conservative group is proud of its record of delivery during the current administration when many neighbouring councils have suffered severe budgetary problems. Quite a few new names in the City areas, plus, unfortunately, some old lags who should have gone ages ago. It will be very interesting to see just how badly the Tories fare ... possibly the only good thing locally to come out of the ongoing Brexit farce is that they may well lose their grip on Herefordshire and we can pull back from the brink (unless the ingoing members find a note to say they've spent all the money!). If the best the Tories can come up with is Vote Tory for a bypass I'm worried. I’d like to wish Amanda Martin & John Harrington all the best as I hope both can get elected as I feel they both will do a good job even though they are not in the same party. I'll second that, Cambo... adding the name of the Indies' Angela Tyler (Aylestone Hill Ward), who called at our house last week to personally canvass our support. She seems to me to be a thoroughly good egg. So good luck to her! would that be a promotion? Good luck Tracy Bowes Belmont Rural, she is an excellent councillor. Just to point out Belmont Rural and Holmer are not City Wards. Cllr Anthony Powers (former leader of IOC, Greyfriars Ward) seems to be standing down. IOC are not fielding a candidate for this ward. I see Kath Hey is standing for my ward (College). She seems to be carpetbagging (loose interpretation) across town. She obviously doesn't fancy standing for Aylestone or Tupsley! Will she knock on my door? Or ring my bell? ~ that is not an innuendo by the way! She will have to make a visit to my house to even have a sniff of attracting my vote. If she visits (and I'm absent) that counts! Quite right. but included wards which people perceive as part of the city due to large housing developments. A Freemason as well. Kath stands a good chance of knocking him off his perch, and I really hope she does, it won't be a moment too soon. Kath is standing at City in Tupsley. 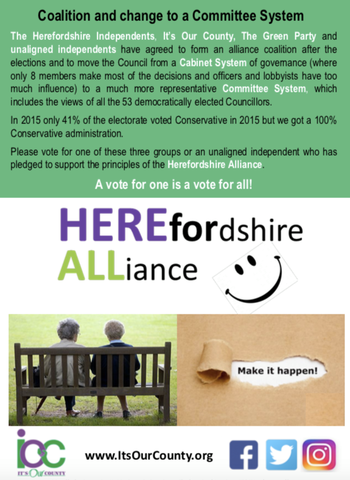 Reason for not standing at County in Tupsley is to help the Herefordshire Alliance as many Tories out as possible. The total cost to local taxpayers to help rescue the struggling college for the blind in Hereford amounts to more than £6m. Herefordshire Council’s contracts and assets cabinet member Harry Bramer made the decision in February to spend £5,395,000 on purchasing the Royal National College of the Blind’s southern campus. The total capital cost amounts to £6.25m which included stamp duty, land tax and other purchase costs of £635,000. Extra costs to cover legal valuation, project management consultant fees and contingency costs are anticipated to total £220,000. Council officers say the project finance will be drawn from the development partnership capital programme bringing forward budget allocated for 2019/20. This is funded from capital receipts reserve. They also say that the RNCB will continue to occupy some of the buildings in the very short term with the view to moving their entire provision to the northern campus by 2020. Hereford College of Arts occupies the main building on the site while having access to other areas and will remain in the building for the long term providing an income stream to the council. The council will be considering growth opportunities with its development partner in the near future and will continue discussions with its key education partners. Chris Jenner, technical services acting assistant director, said in a report: “In the short term the property provides an income stream for the council under an existing lease to the Herefordshire Arts College which is due to expire in 2023. “This income could be deposited in a sinking fund to cover liabilities. The site comprises a number of buildings including a grade II listed red brick Victorian building which is currently used by the arts college under a lease. Other buildings vary in age and use and includes a café. The property has parking areas at different locations across the site. The proposal was circulated to all political groups at Shirehall but no comments or questions were received leading up to the decision. She's definitely standing for College as their ward councillor - the statements are linked further up the thread. She's standing against a UKIP and a Con. There isn't a City ward. There is a Central ward - Jeremy Miln is standing for Greens, against an Independent (proposed by Kenyon), which sort of contradicts the much touted 'cross party co-operation'. You are getting your Herefordshire Independents confused with your Independent Independents. Some of the Independent Independents are working with the Alliance others are ploughing their own furrow. I thought Mark Eden Dykes was also standing as a Newton Farm candidate? Not much information on Bernard Hunt- his leaflet was all about Cllr Edwards (rtd). Had a quick chat with Margy as she put a slip through the door, and she slipped up on her residence and knows nothing about the area! Had Glenda slip. No others. Don't get me wrong but there is no young blood, no one to target the youth. They get a bad rep because there is nothing for them to do! Yes there are a fair few bad eggs but this also rubs off on the good ones. People action with a header. That's what we need. Make your vote count is pretty difficult when there is only one name on the ballot paper. In an astonishing drift towards Soviet democracy, 300 council seats in England have been guaranteed for one party or individual before a single ballot has been cast, weeks before the May 2nd polling day. The closed shop of shoo-in candidates affects around 850,000 voters across Britain. 150 councillors will win their seats without a single vote being cast. In these wards the candidates are running uncontested meaning these candidates ‘win’ their seats automatically. And Parties or independent candidates have also been guaranteed an additional 152 seats, as multi-member wards go ‘under-contested’ – i.e. where a lack of competition means that at least 1 seat in the ward is guaranteed for a particular party or independent candidate. This is because the Labour Party accepts that, in many Wards, FPTP (first past the post) leaves them with no chance of winning. Yet they appear not to be worried about giving their supporters zero choice at local level. In fact, from the Leader downwards, they oppose any move away from FPTP. How curious that a Party so often using “democracy” as its watchword should be so unconcerned about a lack of it.